Over 1000 square feet of executive living! A two double bedroom first floor apartment with open plan living and fully integrated kitchen. Two double bedrooms the master bedroom having en-suite facilities. Floor to ceiling windows, a lift and secure allocated parking for two cars. Be Quick as nearly half the development has been let already! This property is marketed by Alexander & Co, Bicester at £1,250 per month. Rightmove has calculated the price per week for comparison purposes only. Should you wish to proceed with one of the properties featured, a tenancy application fee of £120 (including VAT) per applicant is payable. If a guarantor is required an additional fee of £90 (including VAT) per guarantor is also payable. 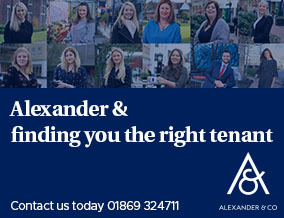 All persons over the age of 18 years are required to be referenced and included on the tenancy agreement. Please note 2 forms of identification in the form of photo ID (e.g. passport or driving licence) and proof of residence (e.g. recent utility bill or bank statement) are required before the referencing process can commence. Please note any additional "Right to Rent" evidence will also be required at this stage, if applicable, to satisfy the Immigration Act requirements. To pass the referencing process applicants are required to have a clear credit score, without CCJ’s, bankruptcy orders or IVA’s. (Please note if references fail the fee will not be refunded). Applicants are required to be in employment and earning in excess, or the equivalent, of 30 x the monthly rental per annum. For example if the rental amount is £500 x 30 the earnings required is £15,000 per annum. A current or most recent landlord reference is also required; please be aware that your current landlord pay charge for providing this. Once references have been approved a tenancy set up fee of £300 (including VAT) becomes payable. A minimum of the equivalent of 1½ month’s rent by way of deposit is required to be paid at least 5 days prior to occupation, together with your first month's rent. Property reference 66004. The information displayed about this property comprises a property advertisement. Rightmove.co.uk makes no warranty as to the accuracy or completeness of the advertisement or any linked or associated information, and Rightmove has no control over the content. This property advertisement does not constitute property particulars. The information is provided and maintained by Alexander & Co, Bicester.